Radio Los Inestables. Photo by Sol del Carpio. 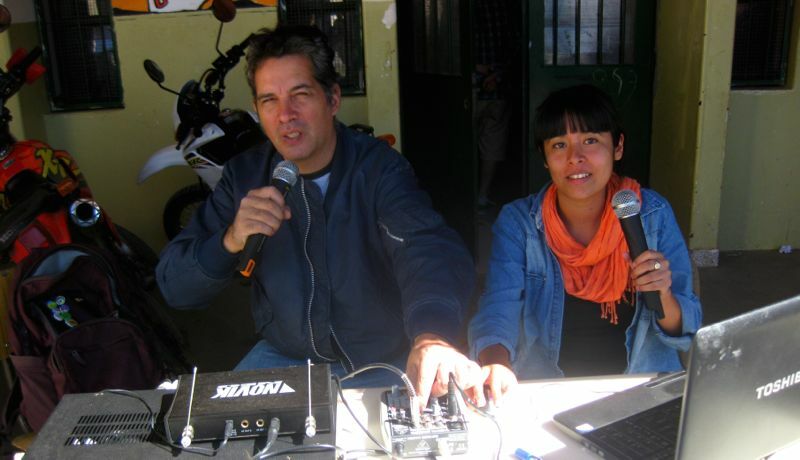 Note from Rising Voices: This post is a collection of impressions about the experiences of people involved in the community project Radio Los Inestables [Radio The Unstable], which is supported by Rising Voices. Radio Los Inestables can be heard in the courtyard of the Provincial Neuropsychiatric Hospital in the city of Córdoba, Argentina. Using words as their weapon, its participants defend, fight for, and create in an atmosphere of shared joy. And the invitation to team up with them is eagerly extended: Come on guys, join us crazies! Es una alegría de participar, oír y trabajar en Los Inestables, porque he tenido muchos problemas y gracias a esta radio, que es un medio que comunica al pueblo, quería agradecer por la hermosa libertad de expresión, y estoy con mucha alegría. It is a pleasure to participate, hear and work with Los Inestables, because I have had a lot of problems and thanks to this radio station, which is a means of communication that addresses the people, I want to say thank your for the wonderful freedom of expression; and I am really happy to be here. Playing broadcaster has given rise to a virtual meeting place where people can discuss, share, and debate common interests and concerns about mental health, as well as subjects related to daily life. Each day's program is created in the space of two hours with input from inpatients, former patients, outpatients, hospital workers, students from different university faculties, artists, and members of the local community. The program is then broadcast by different community radio stations. Nadie les dice ‘tenés que ir al taller de radio’, le gente vuelve sola porque le gusta, porque es un espacio abierto, es tranquilo, es democrático, es pluralista. Porque se puede decir de todo, y se puede discutir. Nobody tells them “you have to go to the radio workshop.” People come back just because they want to, because it is an open space, peaceful, democratic and pluralistic. Because you can say anything, and you can have conversations. Not only are the participants broadcasting their ideas through community radio, but they are breaking down barriers and making their presence felt through poetry, stories and songs. They are reaching the different neighbourhoods of the city of Cordoba, sharing both radio waves and artistic initiatives and encouraging people to question negative stereotypes associated with mental illness. They are accompanied by murgas, mural painters, bands, street whisperers and performance artists—who ensure that every time the radio comes to a certain part of town, it turns into a party. Open radio happenings in public spaces help to strengthen ties between psychiatric patients and the community and also foster collaborative efforts with other social organizations. This project is a reflection of the belief that citizenship is the result not just of having rights but also of being genuinely aware of them. Working together in spaces where there is open exchange of information and communication, people can take an active part in the building and transformation of collective realities. Because “each one of us has value, and even more so when we are together”, this is reason enough for letting a joyful experience be the foundation of a just and inclusive society.